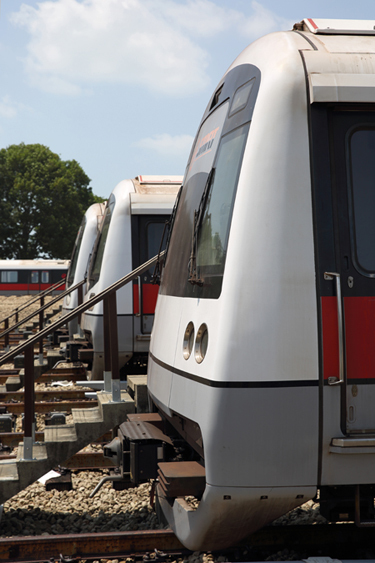 Harnessing the best available technologies and working with forward-thinking research institutions is helping SMRT Trains put more early-warning systems in place and build a rail network that is future-ready. It is not unlike the perfectly-timed choreography of a Formula One pit stop team. Four men from the Emergency Response Unit (ERU) stand trackside on SMRT’s East-West Line (EWL), tool kits in hand. The train passes and they kick into gear, once the Operations Control Centre switches off power. As part of the safety protocols, they confirm that the power rail is no longer “live” and protection measures are in place, before accessing the track to verify that power is off by using voltage testers. They then perform quick rectification work on a loose bolt that secures the claw, which supports the power rail. ERU has a window of five minutes to get the system back on track, before the next train rounds the corner, explained Mr Lee Keen Sing, Director, Permanent Way Engineering and Planning, SMRT Trains. A radio check is conducted, and constant communication is maintained with all involved. Power to the track is restored in time for the next train to arrive on schedule – only after all personnel and equipment are cleared from the track. Minutes earlier, a train-mounted sensor had alerted an on-board computer that the power rail – which supplies electricity to trains – had shifted out of position. It had simultaneously triggered SMS alerts to SMRT Trains’ 24/7 Maintenance Operations Centre (MOC) at Bishan Depot, and the ERU. A visual check showed that the problem could not wait till the trains stop running at 1am, prompting immediate action. The sensors, in use since 2014, have become vital to the smooth running of critical systems. Trains draw power from the power rail through train-mounted current collector device (CCD) shoes. If the power rail sags below an acceptable limit, it could trigger a power disruption. The sensors, which sit in tandem with the CCD shoes, measure the dynamic readings and ensure that the data, with variations as small as 1mm, are within the safety thresholds. The MOC is alerted to potential power rail defects. Condition monitoring systems are a critical part of the whole machinery designed to pick up on potential defects and kick into gear before they even happen. This is critical to the smooth running of SMRT’s trains, explained Mr Lee, who used to oversee the division in charge of technology, project and system management, including the acquisition of new technology. SMRT Trains constantly reviews areas for improvement where technology can be inserted to provide leading indicators for early mitigation of potential issues, thus increasing the availability and reliability of our systems. These mechanical sensors in use – the linear variable differential transducers (LVDT) – were developed in-house by SMRT Corporation to monitor the condition of the power rail during service hours. The LVDTs are currently mounted on five trains on the North-South and East-West Lines (NSEWL). In 2016, about half of all SMS alerts that were triggered prompted immediate rectification work. 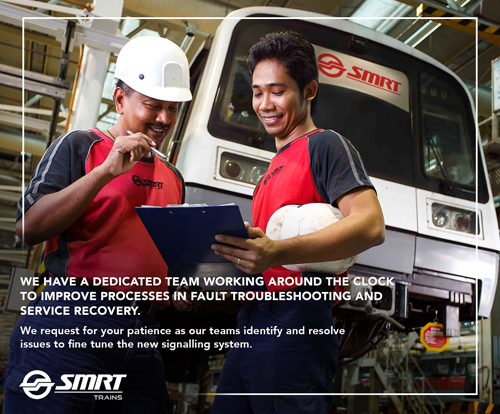 All data collected weekly is plotted against data from previous weeks, allowing SMRT Trains to identify power rail segments for earlier preventive maintenance. This reduces the likelihood of corrective maintenance. “We always do preventive maintenance, but during our weekly “sense-making” session, we also check that the power rail is within its maintenance limit, identify stretches that is degrading faster than normal and bring forward preventive maintenance along those stretches,” Mr Lee explained. These sensors supplement a yellow locomotive called the multifunctional vehicle (MFV) that circulates the entire track during engineering hours between 1am and 4am, collecting information on 16 parameters relating to the track and the power rail. It takes about four to six months to cover the entire NSEWL with a single MFV. 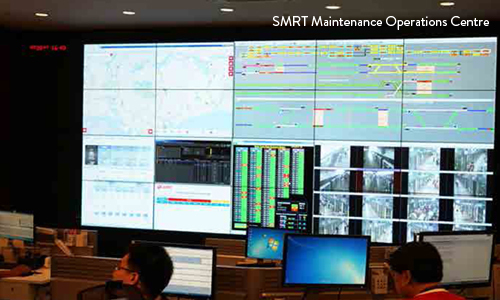 Using the latest available technology, including sensors and analytics, is a major part of the strategy to build a future-proof rail system, even as SMRT Trains works to replace and upgrade large stretches of the 30-year-old network. “We need to move away from just correcting problems and towards being able to predict when such problems might happen. 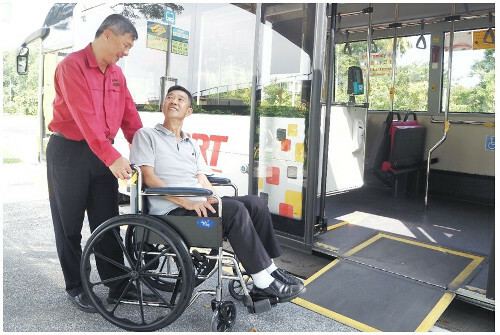 We have to fix or replace things even before they break, because if they do, the cost (to us and to our commuters) is much higher,” Mr Lee explained. “What adds to the challenge is that in the last 30 years, ridership on the network has increased tremendously. Train frequencies have gone up as well. It means the old maintenance rulebooks for existing hardware can be thrown out the window. New ways of assessing risk are needed,” he said. This is especially important as the gauntlet has been thrown down for Singapore to achieve the ‘gold standard’ in rail reliability. In the rail industry, we talk about ‘Mean Kilometres before Failure’ (MKBF), which measures delays of more than five minutes. The MKBF for the NSL improved from 156,000 train-km in 2016 to 291,000 train-km in the first quarter of 2017, while the EWL improved from 145,000 train-km in 2016 to 215,000 train-km in 1Q2017. The Circle Line (CCL) also improved 228,000 train-km in 2016 to 452,000 train-km in 1Q2017. The target is to achieve 300,000 train-km by the end of 2017. The challenge was laid down by Transport Minister Khaw Boon Wan for Singapore to achieve 400,000 train-km by 2018. 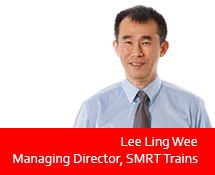 It will involve putting in place systems and processes that will allow SMRT Trains to predict potential failures in a more accurate and timely way, Mr Lee said. This could include condition monitoring of critical assets and equipment, predictive maintenance and a tighter integration of data collection devices with analytical tools. 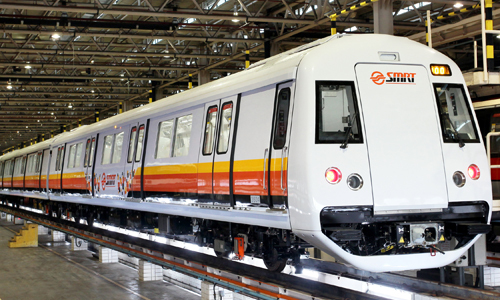 “We think that it is important for the company to make these strategic investments even though it will probably take a few years to acquire the new capabilities,” explains Mr Lee Ling Wee, Chief Executive Officer, SMRT Trains. SMRT Corporation has been working with research institutes and academics to develop analytical engineering tools to predict future failures. It is working with the Hong Kong Polytechnic University to develop a sensor system similar to the one currently in use by the Hong Kong MTR. These sensors watch for anomalous vibrations as proxies to track and train conditions, so that emerging issues can be rectified early, before they cause problems. When the system for Singapore is completed next year, these new sensors, placed along two to four sectors of the track and on two trains, will provide a running health check of the system. 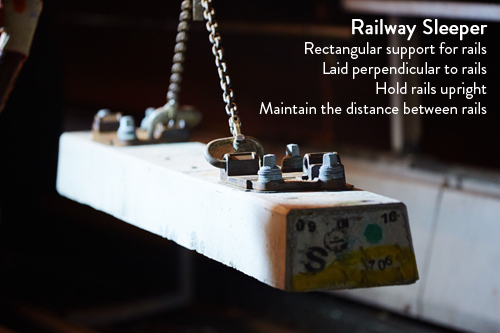 They will be able to pick up on up to six parameters, including if and how much the rail has been worn down, and if there are cracks or chips on the track. On trains, details like the level of suspension or the condition of the wheels can be monitored, which can affect how comfortable a ride is. The SMRT-NTU Corporate Lab, a collaboration with the Nanyang Technological University, is co-funded by the National Research Foundation. The five-year, $60-million programme will look at how rail systems can be maintained more cost effectively. 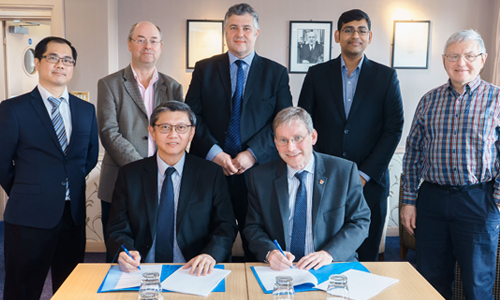 SMRT Corporation has also signed a five-year master research collaboration agreement with national research institute A*STAR to develop sensors that will allow for better early warning systems, as well as a memorandum of understanding with the University of Birmingham to enhance rail reliability. It is also looking into technologies to better monitor other subsystems on the train, including doors, air-conditioners and brakes. 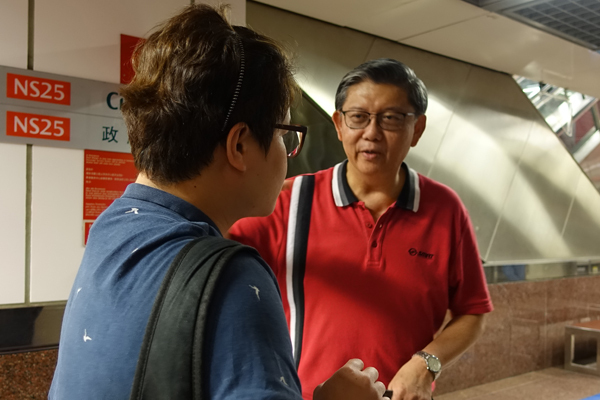 “Knowing what’s in best shape and where weaknesses lie, could allow SMRT Trains to, for example, send out its best-conditioned trains during peak hours, further reducing chances of a delay or breakdown,” said Mr Lee Keen Sing. Ultimately, it means having a rail network that is more resilient, and one that gets commuters to where they need to go, he added. “Currently, we only measure critical systems, but we are working to move to a stage where we can measure everything, and better optimise our resources while ensuring fewer delays and disruptions for commuters in the long run. 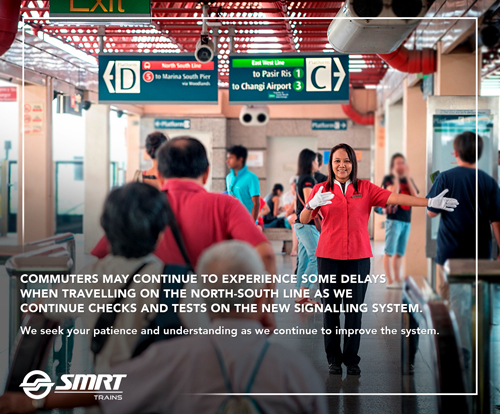 Weekday system-level performance checks on the new signalling system for North-South Line (NSL) commenced on 29 May 2017. As the new signalling system is fine-tuned by engineers, commuters may expect teething issues from the new system while aboard NSL trains between Marina South Pier and Jurong East. This guide explains some of the situations you may encounter on the NSL during the signalling checks. 1. 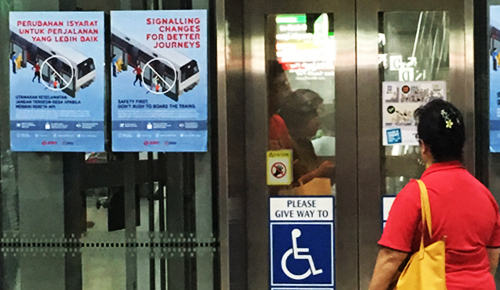 Why is SMRT Trains changing to a new signalling system? What are the benefits to commuters? The new signalling system will be more efficient than the current system, which has been in use since 1987. We will be able to safely reduce the distance between trains travelling on the network, and further increase the number of trains. This means shorter waiting times for commuters. 2. Why does the train stop between stations? For safety reasons, all trains are programmed to maintain a distance between one another. Trains will not proceed if there is another train up ahead. 3. Why did the train overshoot the platform and have to reverse? The new signalling system comes with various pre-set programmes to run and stop trains at various speeds. These pre-set programmes are being fine-tuned to suit different weather conditions. For example, the braking distance for a train arriving at Ang Mo Kio MRT Station (aboveground) on a clear day, would differ from that required during a thunderstorm. Wet tracks would require a longer distance for trains to come to a stop. Trains may therefore not align correctly at station platforms. It is important to note that passengers will remain safe, as all trains are programmed to maintain a safety distance between one another. Trains will not proceed if there is another train up ahead. If the alignment is incorrect, trains will reverse for passengers to board and alight. In the rare event that the misalignment is more than 15 metres, trains proceed to the next station as programmed. 4. Why do the doors close so fast? As we work towards the target of having more trains, and shorter waiting times for commuters, trains will have to stop for fixed intervals at stations. The new signalling system will also open and close doors automatically. The dwell time (i.e. the duration of trains stopping at station platforms) remains the same. Doors continue to remain open for about 30 seconds at most stations. Please do not rush to board the trains. Please look out for light indicators and audio chimes, which indicate that train doors are closing. Train doors will close automatically soon after the lights flash and door chimes go off. 5. Why did my train brake suddenly? Signalling systems are used to direct railway traffic. Trains move when the system indicates so, and stop when they receive a signal from the system. Signalling systems are built with safety as the top priority. Emergency brakes are applied when trains receive incorrect or conflicting signals, do not receive any signals momentarily, or when there are trains ahead. The signalling system is then reset, to ensure trains only move according to assigned signals. 6. Why are the performance checks carried out during peak hours? Can’t the checks be done during off-peak hours? Trains fitted with the new signalling system have been put through rigorous checks before they were cleared for passenger service. Earlier trials took place during the last hour of passenger service, and progressed to whole of Sundays. Unlike new MRT lines where intensive testing can be conducted with a single type of train before passenger service commences, we are testing the new signalling system on an existing line with various train fleets. As there are limited engineering hours each day (from 1.30am to 4.30am), it is not possible for us to accumulate adequate testing hours if we do not run the new signalling system during weekdays. The June school holidays present the best opportunity for us to do so. We have to conduct all-day performance checks to work out teething issues that may arise when a new signalling system is introduced to a train network. The system-level performance checks on weekdays will allow us to further intensify tests of the new signalling system’s reliability. Our engineers will continue to monitor the system’s response to different situations, and trains services’ adherence to their schedules. 7. There were delays on 1 & 2 June 2017. What happened? The first incident at 6.20pm on 1 June 2017 was due to a glitch in the computer server used to manage train schedules. This unfortunately caused all trains on NSL to halt. Although the back-up server kicked in quickly, operations controllers needed 30 minutes to manually reassign train schedules. On 2 June 2017, a signalling equipment known as the Movement Authority Unit (MAU) registered a fault at around 4.48pm. The MAU fault resulted in slower train movement between Kranji and Admiralty stations. Signalling trials are part and parcel of new signalling systems and carried out to help train operators identify and resolve teething problems that may occur. As we continue to intensify the testing of the new signalling system and until the system stabilises, there may potentially be more disruptions. We seek the understanding of commuters. To enhance rail reliability and to provide better journeys for millions of commuters who travel with SMRT every day, we embarked on the biggest rail transformation programme since rail operations began in Singapore in 1987. 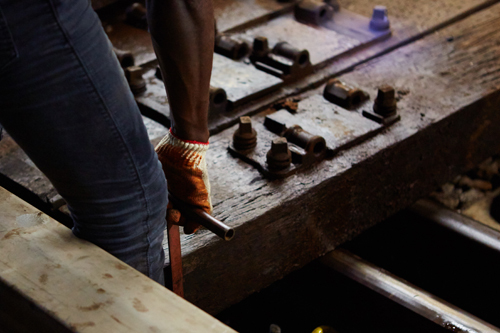 The sleeper replacement project on the North-South and East-West Lines (NSEWL) began in 2013, where 188,000 ageing timber sleepers were to be replaced with concrete sleepers. 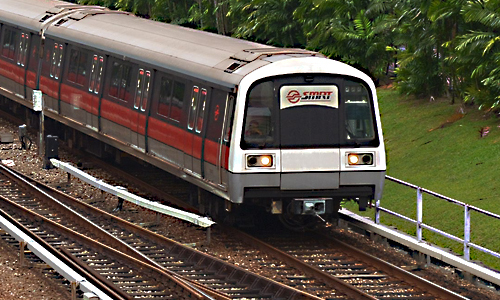 A joint team comprising SMRT and the Land Transport Authority (LTA) was formed in June 2012 to look into reducing disruptions and increasing the reliability of the NSEWL. Other rail transformation projects, including re-signalling and third rail replacement programmes were carried out concurrently. All rail renewal and maintenance works are carried out between 1.30 AM and 4.30 AM, after the last trains arrived at the depots, and before the first trains depart the depots for the start of service. Actual work hours are much more limited because of the time needed to transport machinery to the work site. Starting with four road-rail vehicles (RRV) in 2013, before increasing the fleet to 14 in early 2016, these vehicles were used to mechanise the replacement of sleepers, a process which was initially done manually. The use of RRVs helped to accelerate the sleeper replacement schedule. In addition, fixed gantry cranes were brought in in early 2016. They were located at two ends of the EWL – at Pasir Ris overrun, and between Chinese Garden and Lakeside stations. The gantry cranes, which were 20 metres in height and weighed 74 tonnes, were used to hoist the RRVs and concrete sleepers from the ground on to the tracks. They allowed the RRVs to deploy more quickly to the work front and thus allowing more sleepers to be replaced each night. Six Temporary Staging Areas (TSAs) were located at Kallang, Redhill, Chinese Garden, Pasir Ris, Changi, and Ulu Pandan to act as holding bays for RRVs and other heavy machinery. Roger Lim, Project Director, Track and Infrastructure; and concurrently Vice President, Circle Line and Bukit Panjang LRT Projects, said “As we take apart parts of the track each night, we need to be very judicious on safety and quality checks when we put back everything within the three-hour engineering window. We have to make sure all systems are in order and ready for service each morning. In the last three years, measures such as speed restrictions and shorter operating hours were imposed. With the use of heavy machinery, moving of extremely heavy equipment and materials, and works such as welding and tamping, it was inevitable that noise would be generated. Our teams took all necessary steps to minimise noise and light pollution in the early hours of the morning- including using monitoring devices and barriers to keep noise levels to a minimum, and keeping night lights pointed away from residential homes. There was an unmistakeable sense of excitement and pride at Clementi MRT Station at 1AM. Representatives from SMRT, LTA and our contractors were in high spirits as the RRV appeared in sight for the final time. They watched the last wooden sleeper on the westbound track was removed. The final concrete sleeper was laid on 20 December 2016 – a full three years ahead of its original target of 2019. 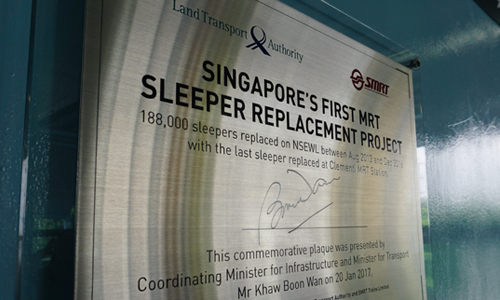 Coordinating Minister for Infrastructure and Minister for Transport Khaw Boon Wan officiated the completion of the sleeper replacement programme on 20 January 2017. 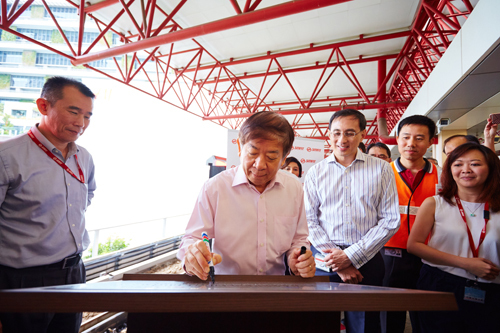 Accompanied by President and Group CEO Desmond Kuek, the minister signed a commemorative plaque to be installed at Clementi MRT Station, where the last batch of wooden sleepers were replaced. The sleeper replacement programme is the first of many milestones to come. As speed restrictions are lifted, our commuters can enjoy safer, smoother and faster rides on our network. We also look forward to the completion of our re-signalling and third rail replacement projects which will improve the journey experience for all commuters.